I remember the first time I saw my mom grating carrots to make carrot cake. Like most kids, I could not believe that a cake could be any good at all if it had carrots in it. My mom promised me that if I tried it I would like it, and of course she was right. As an adult I have to admit that I still wonder how a cake with carrots in it can taste so good. Along with the carrots, this recipe contains crushed pineapple and coconut which add extra taste, texture, and moisture to the cake. I have admitted to not being a big fan of coconut. But after trying it in the Ranger Cookies that I made a few weeks ago and liking it, I decided it was worth a try in these cupcakes. And now that I have tried it, I don't think I will ever make carrot cake without coconut. 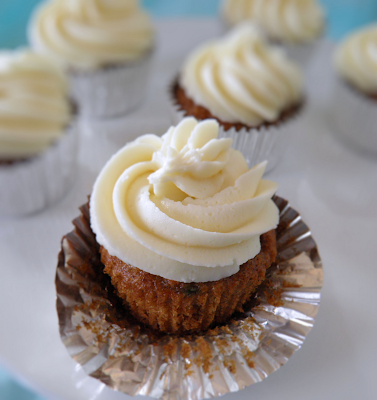 Carrot cake cupcakes with pineapple and coconut. 1. Preheat oven to 350°F.2. In a large bowl combine eggs, buttermilk, oil, sugar, vanilla, and mix well3. In a separate bowl sift together the flour, cinnamon, baking soda, and salt.4. Gradually add the dry ingredients to the wet ingredients.5. Mix together carrots, coconut, and pineapple then fold into batter.6. 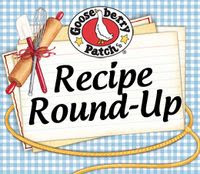 Pour batter into lined muffin tins and bake for 18 - 22 minutes or until a toothpick inserted into the center of a cupcake comes out clean.7. Cool cupcakes completely before frosting.8. To make the frosting, cream together the butter and cream cheese until well combined.9. Gradually add the confectioners' sugar until thoroughly incorporated.10. Add the vanilla and beat until smooth; refrigerate until ready to use. I used tip #847 from the Ateco Large Tube Set to frost the cupcakes. I refrigerate the cream cheese frosting and then frost the cupcakes as we eat them. If you frost all the cupcakes at once, any that are not eaten should be covered and refrigerated. Cake recipe was adapted from Allrecipes.com. What lovely cupcakes! I love the way you frost them...look so good! As Jeannie said: Lovelly cupcakes!!! They have everything good in them:vegies,fruit, cheese, and cake.Full meal! These look great! My fiance loves carrot cake, I will have to try this sometime! I adore carrot cake...great idea to make them into cupcakes! I'm sure that these would disappear in no time in my houe. Thanks for sharing! Carrot cake just might be my favorite cake. These cupcakes are beautiful and so tempting. Thanks for the recipe! This cake looks so moist! I'm drooling on my keyboard. I love that you added pineapple and coconut! I think it gives such pizazz to plain carrot cakes. These look yummy! 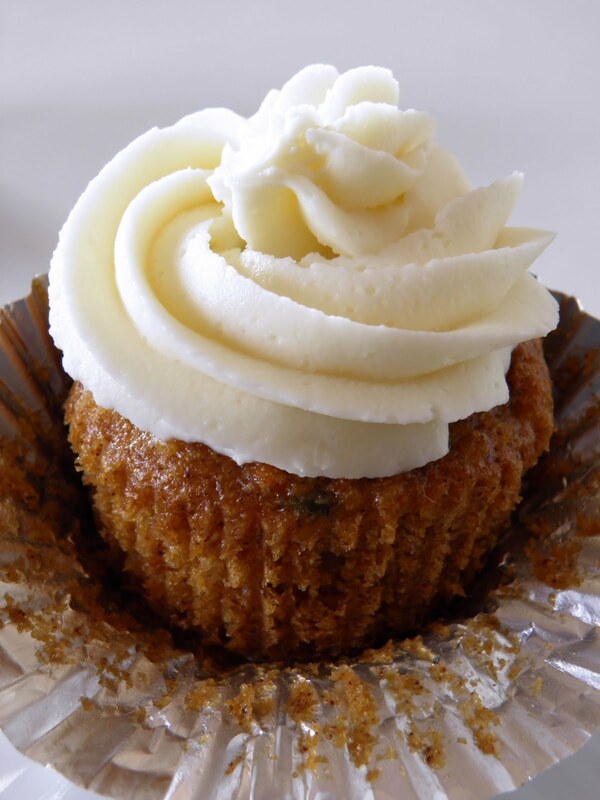 It does seem a bit unnatural how wonderful carrot cake tastes...right up there with zucchini. ;) These cupcakes look fabulous. These cupcakes look great! I'm a big carrot cake fan and I'm glad you're on board with coconut now! These look yummy and so pretty. Thanks for stopping by my site, so I could find yours! I have a office birthday to bake for and these are just perfect for it! 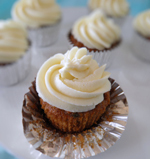 Delicious cupcake...I love your photo and recipe too! Thanks for sharing and have wonderful week! Carrot cake just HAS to be my favourite cake but as a cake, it's always too big. Your cupcakes are just perfect! I'd only eat one, then two, then you'd have to take the plate away! Okay..these are just plain dangereous! I don't think I could stop popping these little cuties into my mouth. They look so perfect. Great job! PS... thank you for dropping by curry and comfort and commenting on my cake. I look up to anyone that can bake and you make it look so darn beautiful. YUM! This looks absolutely delicious! I love finding new cooking blogs and I am so glad I stumbled upon yours! I am your newest follower and would love it if you would come check out my blog and follow me too! Thanks!